West Plains Council on the Arts (WPCA) will host an exhibition of works by Audrey Bottrell-Parks entitled “Impressions” at the Gallery at the Center, West Plains Civic Center from November 5 – December 2, 2018. The Gallery, on the mezzanine, is open to the public during regular Civic Center hours. Memories leave impressions in our mind. It could be a look on someone’s face, the feel of light on an object or place. Sometimes those impressions are a bit fuzzy and others have more clarity. This exhibit is a collection of impressions of people, places or things rendered in graphite, charcoal, pastel and acrylic. It is the artist’s hope that you would be moved by these impressions. Bottrell-Parks is a Best of Missouri Hands Juried Artist, commissioned artist for ESPN, Missouri Sports Hall of Fame, Promega Corporation, MSU West Plains, PGA golfers and a host of others. She brings years of professional experience to the classroom. Earning her Art Education degree in her home state of Wisconsin in 1979, she has taught publicly and privately for more than 30 years. Her portraits grace the walls of homes and businesses worldwide and have been published internationally. The ESPN portraits were unveiled on the nationally televised Skins Games in 2003 and 2004. She is the recipient of numerous awards. Bottrell-Parks currently teaches weekly classes at Splatter Art Studio in Springfield, MO and specialty workshops in the area. For more information on classes, portraits or workshops, contact her directly at 417-848-0894. Visit her website at www.audreybottrell.com. “My work has been predominantly realistic portraits of people and animals in graphite, charcoal, pastel or acrylic. I’ve always been intrigued with bringing a piece of paper or canvas to life with a portrait. There is something so captivating drawing life and it gives me such a rush that I hurry back to do it all over again! Creating is a calming therapy in a chaotic world. I love to create for the sheer joy it brings. It is also the reason I love to teach, so my students can experience this joy too!”, says the artist. WPCA will host an Exhibit Reception on Saturday, November 10, from 2-4 p.m., in the Gallery at the Center. All are invited to attend, view and discuss these wonderful pieces. 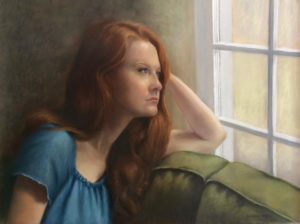 The exhibit is co-sponsored by the West Plains Civic Center and West Plains Council on the Arts, with partial funding provided by Missouri Arts Council, a state agency.